Two men, including the son of actress Annie Potts, spent a cold night on Mount Baldy after they lost their way in heavy fog, sparking a search that ended Monday when the two found a trail and hiked out of the wilderness. Clay Senechal, 23, and screenwriter Jonathan Lempkin, 43, whose credits include "The Devil's Advocate" and "Lethal Weapon 4," were scheduled to return from a day of hiking around 7 p.m. Sunday. Searchers were called out later that night. Senechal is the son of Potts, who starred in the television show "Designing Women" and played Bo Peep in "Toy Story 2," and of director B. Scott Senechal. After heavy fog closed in around them, the two decided it would be safer to spend the night on the mountain and hike out the following morning. Rescue workers searched all night after family members reported the hikers missing late Sunday. They found the men's Range Rover at the base of a trail head. "They searched all night," San Bernardino County sheriff's department spokeswoman Robin Haynal said. "It's very icy up there because we've had a lot of snow, and it's very rough terrain." 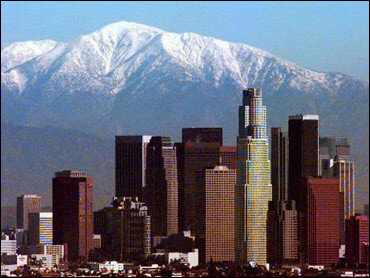 The 10,064-foot mountain, the tallest peak in the San Gabriel Mountains, is about 40 miles northeast of downtown Los Angeles.